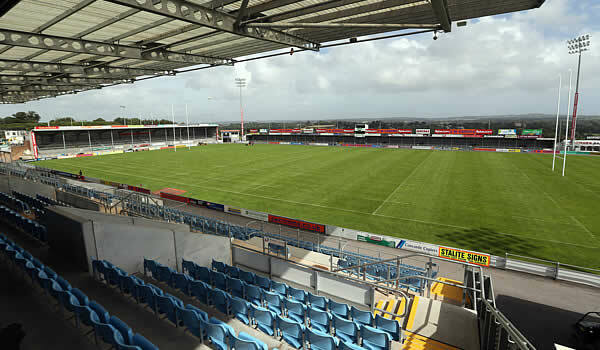 Exeter Chiefs have named several youngsters in their team to play Welsh side the Ospreys in their Anglo Welsh LV Cup clash at Sandy Park on Saturday. Among those set to get their chance from the outset are several of the club’s highly-rated youngsters such as Luke Cowan-Dickie, Lloyd Fairbrother, Will Carrick-Smith, Stu Townsend and Tom Hendrickson, the latter two of whom are poised to make their first-ever starts for the Chiefs. And skills coach Ricky Pellow says that group of players should look to follow in the studmarks of the likes of Henry Slade, Dave Ewers, Sam Hill and Jack Nowell, all of whom have spent this past week working within the England Rugby set-up. “You think this time last year and the year before, you had the likes of Henry Slade, Jack Nowell, Dave Ewers and Sam Hill, they were all playing these games and they were developing as players,” said Pellow. “If you look at the side we are going to put out this weekend, especially with the likes of Stu Townsend at nine, he’s coming in at the age of 18 to play alongside Ceri Sweeney, a guy who has played at the very top end of the game and won numerous caps, so it’s going to be a massive experience for him to learn from. “It’s also going to be a real good opportunity for a lot of the other young lads because it’s a chance for them to show what they can do in what will be a very competitive game. At the same time, there are a few of the experienced guys who are chomping at the bit to get out there and show what they can do as well. “This group of players have a massive opportunity to build some momentum, especially after last weekend’s result, and in any club if you can build momentum it will set you nicely moving forward. Meanwhile, Jonathan Spratt will make his 50th Ospreys appearance and captain the side from outside centre. “This is always an exciting period, when we get a good opportunity to take a close look at some of the next generation of Ospreys,” said Ospreys head coach Steve Tandy. “These youngsters bring with them a real enthusiasm into the environment and a desire to learn and improve. That rubs off on the more established players, who have a key role to play themselves over the next couple of months, and creates a different kind of dynamic around the place. “The LV= Cup is a competition that had provided a platform for a number of up and coming players to establish themselves in recent seasons. You’ve got people like Justin Tipuric, James King, Rhys Webb and Hanno Dirksen who have taken the opportunity given to them in the competition and kicked on to really become fully fledged Ospreys. That’s the key message to boys involved over the next couple of weeks. Make us sit up and take notice, really show us what you can do, and who knows what can follow on? “We’re expecting a tough couple of games, against Exeter on Saturday and then at Bridgend against Sale the following weekend. Both teams will be physical and strong, and will provide a real test for this group. It’ll be a great experience for them and as a coaching group we are really looking forward to seeing how they fare, as the supporters are no doubt.